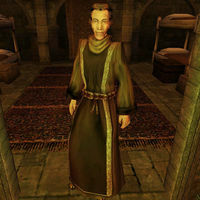 Arnand Liric is a Breton healer who works at Buckmoth Legion Fort near Ald'ruhn. He sells ingredients, potions, and spells, and offers training to anyone who needs it. He is a member of the Imperial Legion, so if you are also, you will have to be wearing a uniform in order to talk to him. He keeps a restocking supply of assorted restorative potions and ingredients. He also offers medium Training in Mysticism, Restoration, and Alteration. He wears a common robe and matching shoes, and he carries his entire supply of restocking raw ingredients. * This spell is actually useless, since it is impossible to cast spells while paralyzed. However, you can get access to the effect in order to create on touch/target enchantments or custom spells.